This is a continuation of a series of posts of my Missouri Vacation which I took the first week of September. To start at the beginning go HERE. The rest of the posts, in consecutive order are HERE and HERE. On the third day of our vacation in Missouri we spent the morning in Elephant Rock State Park. 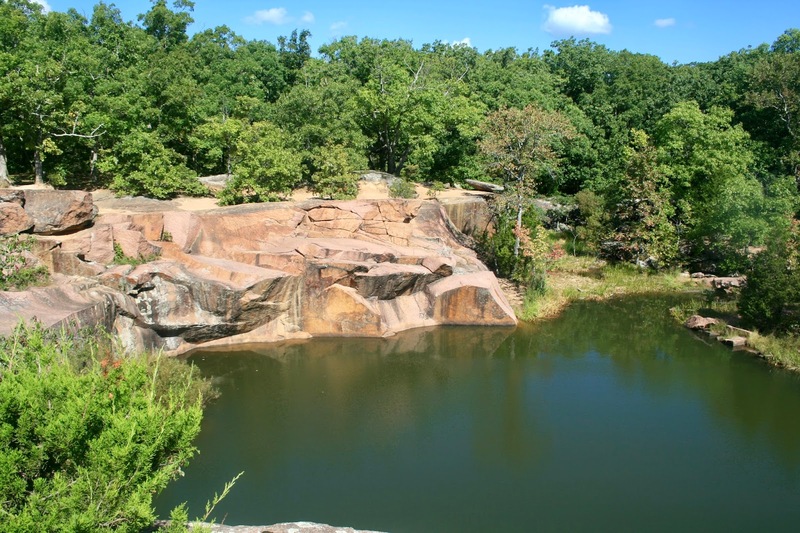 It is one of Missouri's most popular state parks for it is very family friendly and people of all ages and abilities can enjoy it. 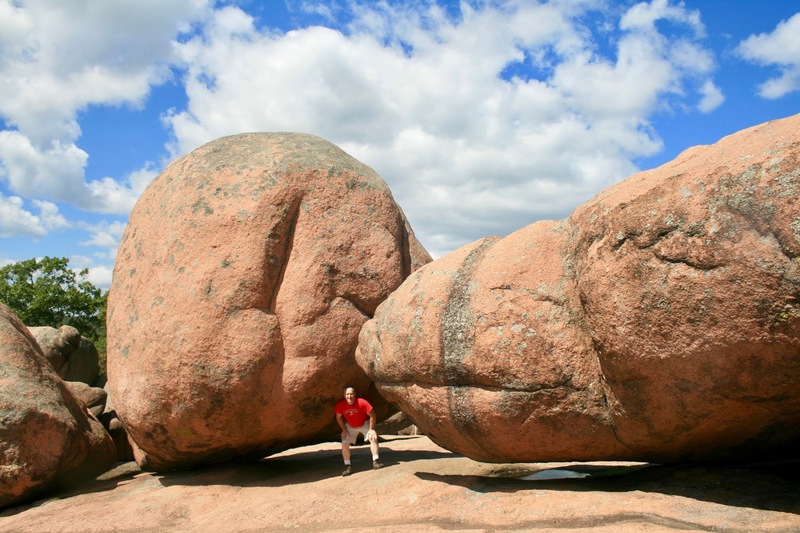 Plus, they have some of the best, largest, rock formations I have ever seen! 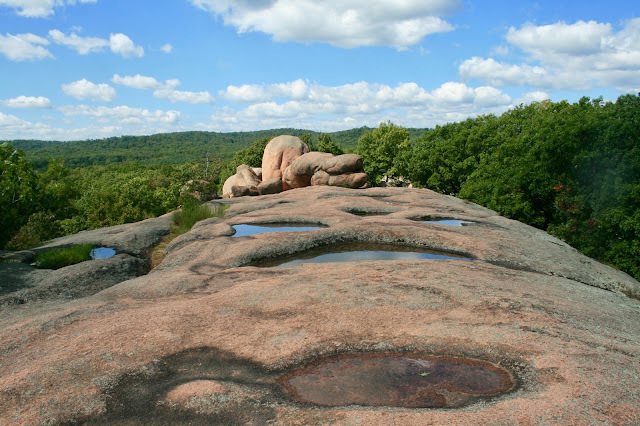 The main trail of Elephant Rock State Park is the "Braille Trail". It is only a one mile loop, but we ended up hiking all morning because there are many spurs where you can venture off the trail to explore even more! 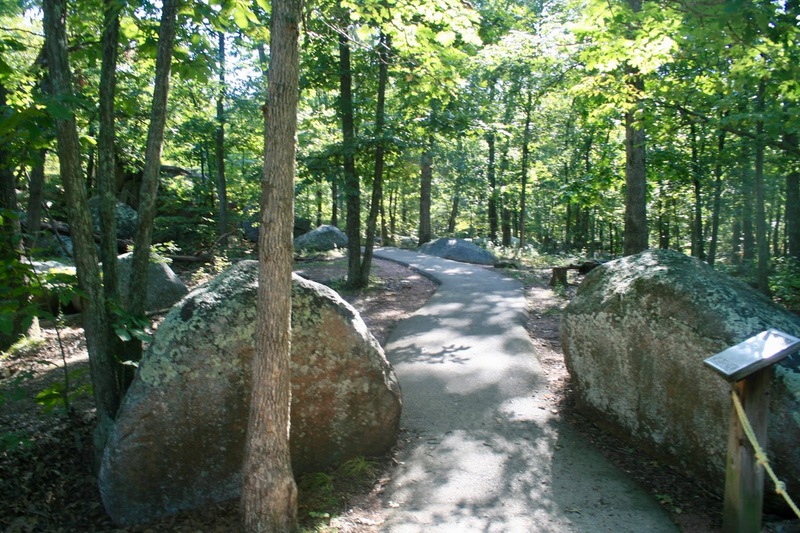 It is called the Braille Trail because it is specifically designed for people with visual or physical disabilities. There are signs in braille as well as an asphalt trail. 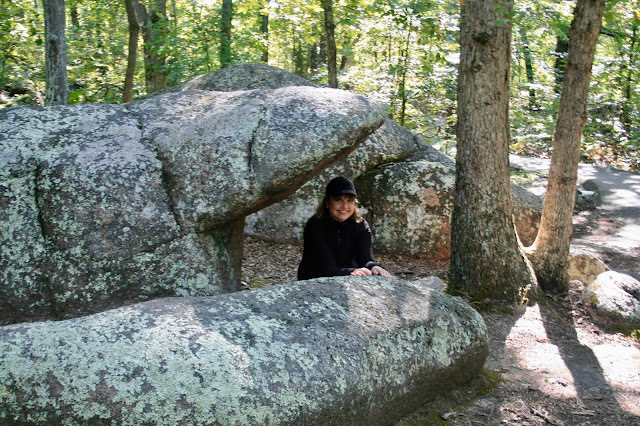 The first part of the trail takes you through a shady forest where there are so many fun and interesting rock formations. We saw a lot of trees that grew around rocks, like the one below. Those without physical limitations can venture off the asphalt path and climb and explore the rocks further. The park is named Elephant Rock because of the elephant shaped boulders that stand end-to-end like a train of circus elephants. However, with a little imagination, one can see lots of other animal shapes in the rock formations. My husband thought the one below looked like a great white shark with his mouth open; so he decided I should pretend I'm inside it's mouth! 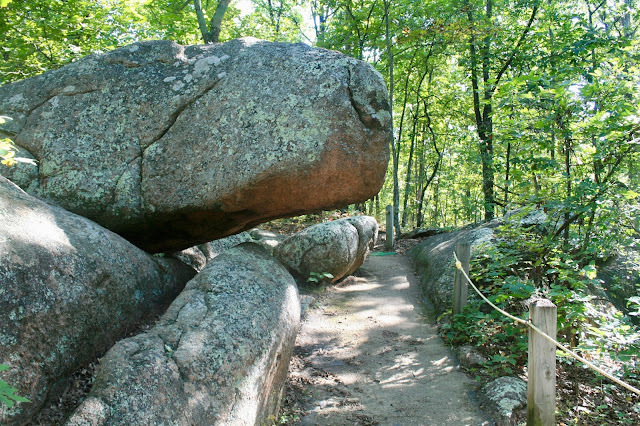 We liked how this large rock hung over the path. The visually impaired were instructed to hang onto the rope on the right to avoid hitting their head! 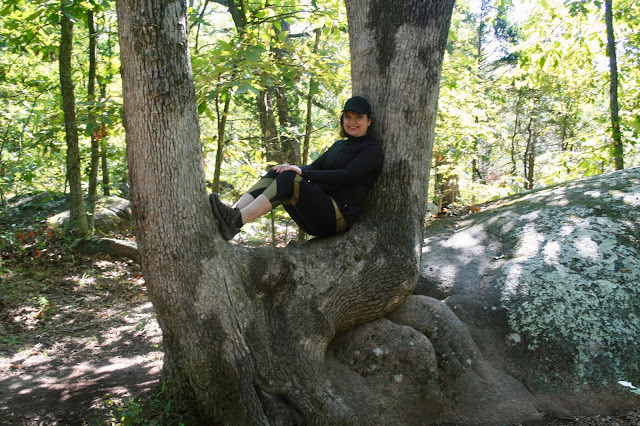 Isn't this a fun tree? It also grew around a large rock. Mother Nature always seems to find a way, doesn't she? 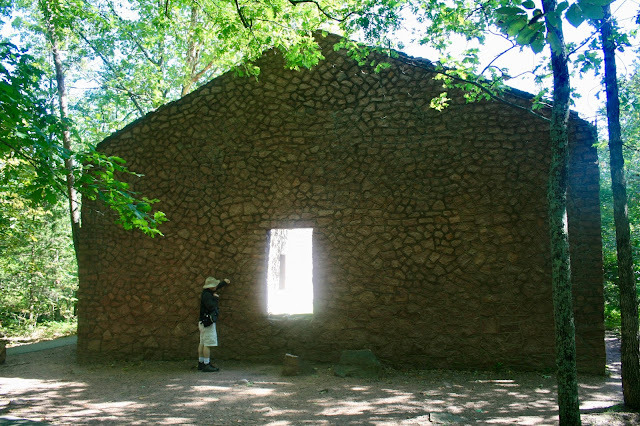 There is a short .40 mile trail called the "Engine House Trail" that you can take off the Braille Trail to see the ruins of an old engine house. It is a dirt path, unpaved, so it's not handicapped accessible. The engine house originally was built to repair train engines and cars from the Iron Mountain and Southern Railroad in the 1890s. It is also serviced quarry operations, which are no longer in operation for it is the state park. 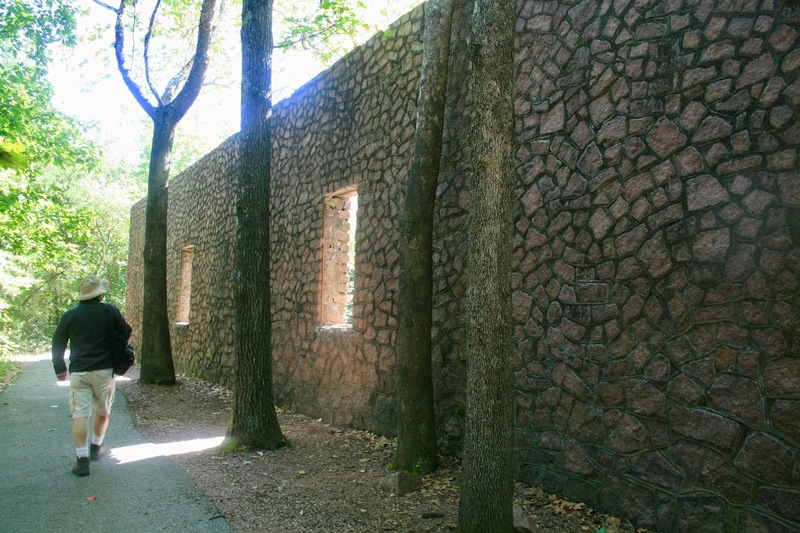 It's quite fascinating to see how rocks from the quarry were used to make these interesting walls. 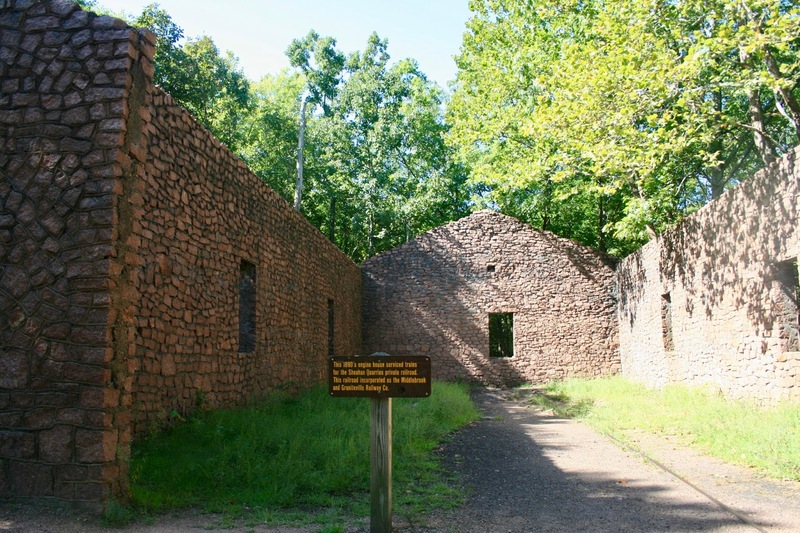 After viewing the old engine house, you can either return directly back to the Braille Trail or take a hike through the woods on the Engine House Trail which will eventually reconnect with the Braille Trail. 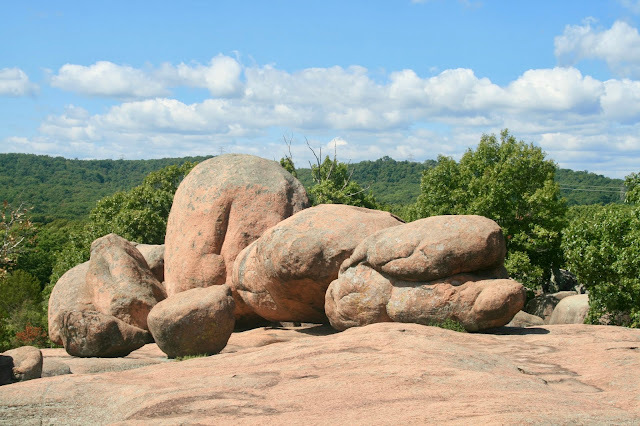 Since it was so short, we chose the woods, and we were glad we did or we would not have spotted this: it is a smaller quarry that most visitors wouldn't know about because only the larger quarry is off the Braille Trail. This one is a bit more dangerous to view however, for there are no guard rails or viewing decks. We did get a tiny bit lost on this trail; somehow, we missed the trail markers. But eventually we heard people on the Braille Trail and just cut through the forest to get to them. 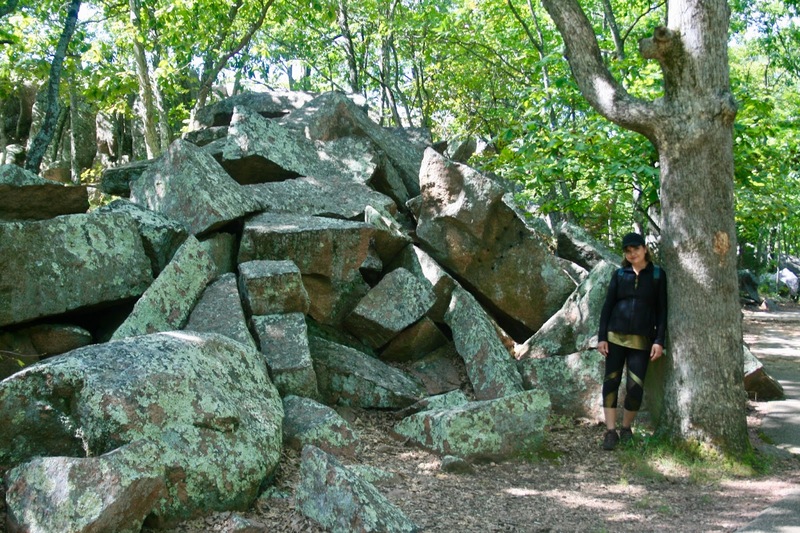 At first glance this park can seem too simple for an experienced hiker, but there are so many nooks and crannies to explore that hikers of all abilities and experiences can certainly enjoy it. You just have to get off the asphalt path and explore! You never know what you will discover! 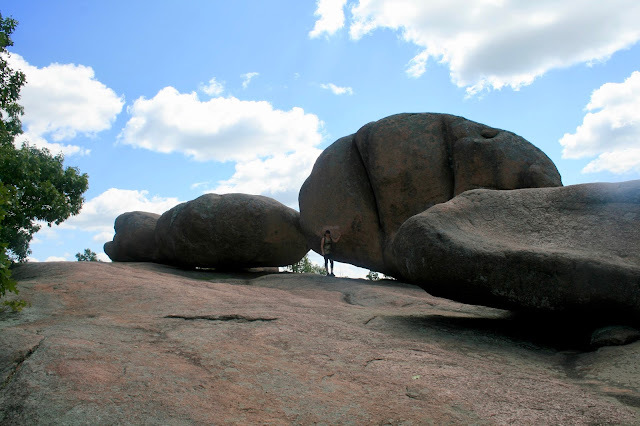 We loved this massive rock formation where the rocks were so long they seemed to swallow me up. 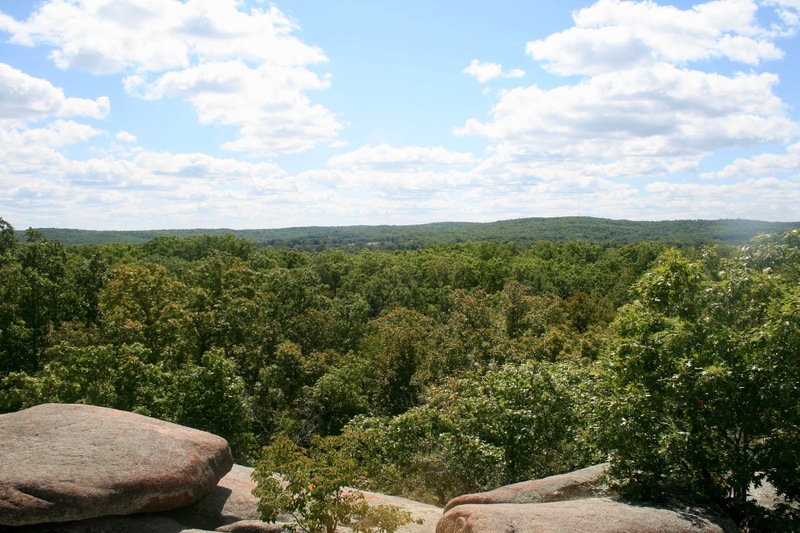 There are lots of scenic over looks where you can enjoy views of the large quarry and the woodland views. 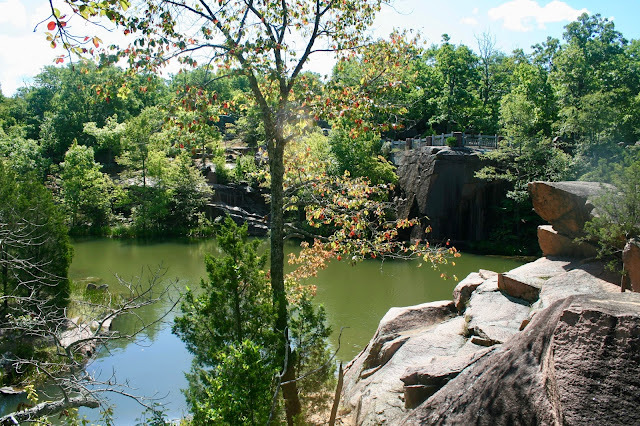 The scenic overlook of this large quarry is so beautiful! 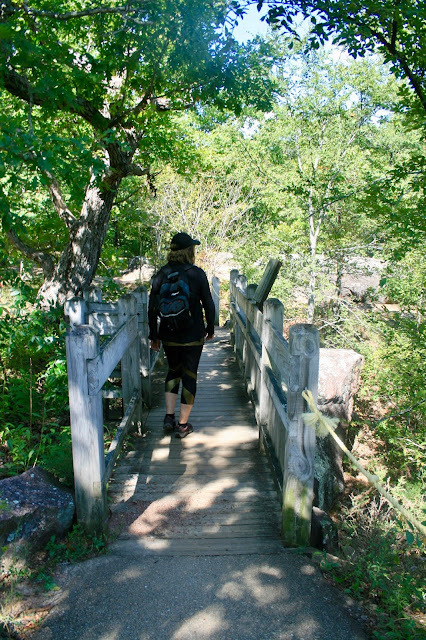 You can get to the other side of the quarry by taking this cute wooden bridge. This picture was taken from the other side of the scenic overlook. See the fence in the upper right corner? That is the scenic overlook which is right off the Braille Trail. There is not a fence on this side. Through out the park you often come across piles of rock like this. We think they were just dumped there when the park was used as a quarry. We loved getting off the beaten path and climbing the rocks. 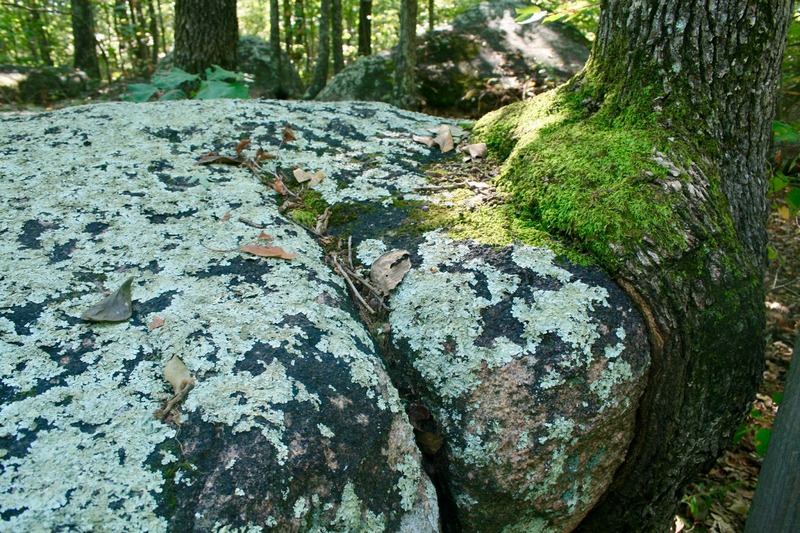 If you don't, you'll miss interesting stuff like trees growing out of rocks! Or incredible cluster of rock formations like this! 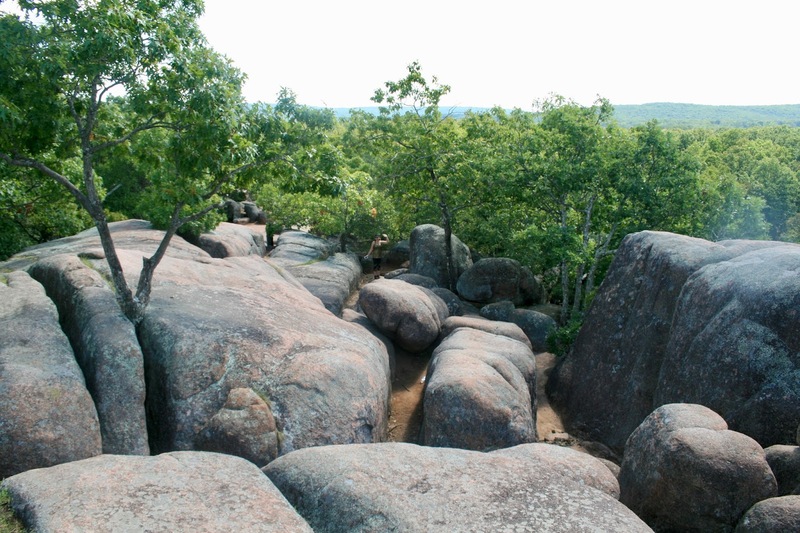 Not to mention, when you climb to the top of these boulders, look at the views you see! And finally, the namesake of the park: the elephant rocks. 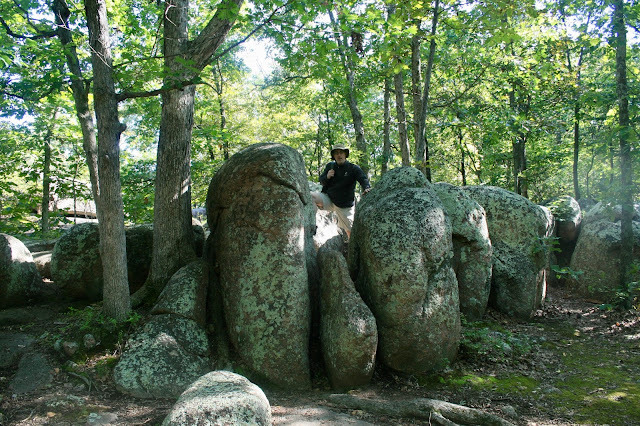 This section of the park really reminded of Colorado's Garden of the Gods. It was very hot and sunny in this area (notice we removed our jackets? ), and the scale of these rocks was phenomenal. 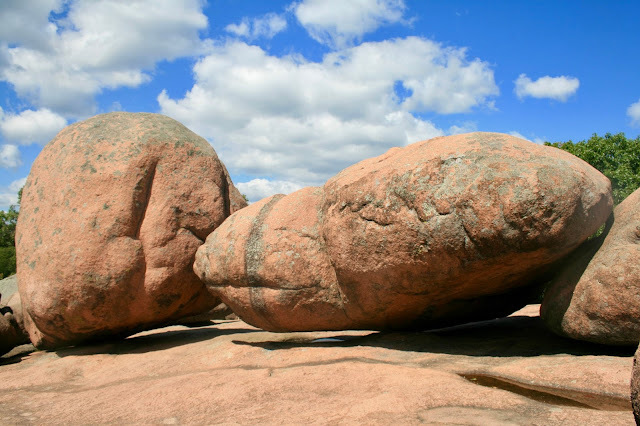 I remember when I took the spur off the Braille Trail and these rocks came into view I exhaled and said "WOW! Now that's impressive". It's like you step out of the woods and shade, and suddenly your on top of the world! To get an idea of the scale of these elephants, here I am standing next to one in the photo below. 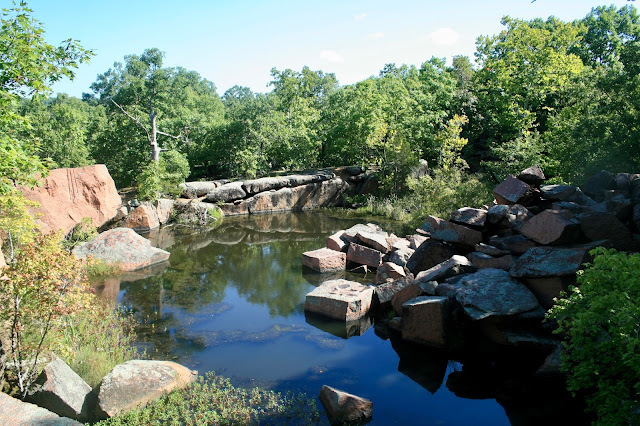 Although flat and safe for people of all ages and abilities to explore, this section of the park is not handicapped accessible. 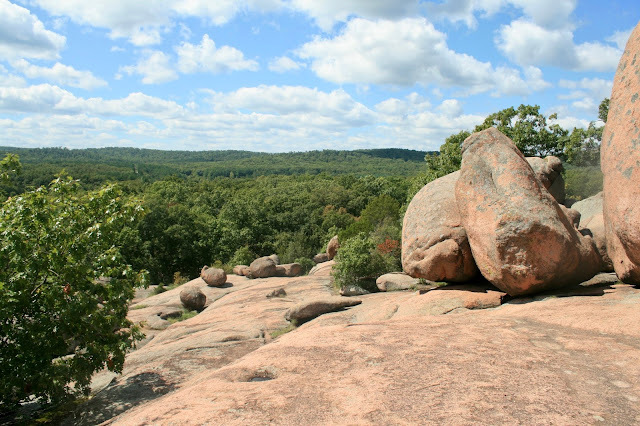 The views from this section of the park are breath-taking. If you visit this park, I highly suggest leaving this part for last, as it will be the highlight of your trip! We climbed around up here for over an hour before returning to the Braille Trail. There were so many fun little spots to explore. Every time we thought we were done discovering something new, we would round a corner and see something else that blew our minds! 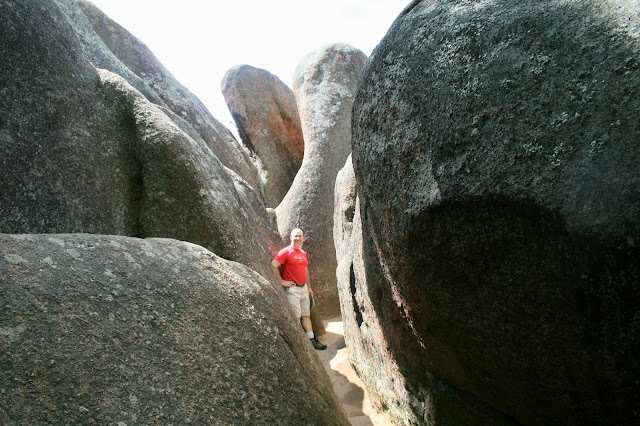 We loved this tight cluster of rocks with a passage so small we could barely squeeze through it! 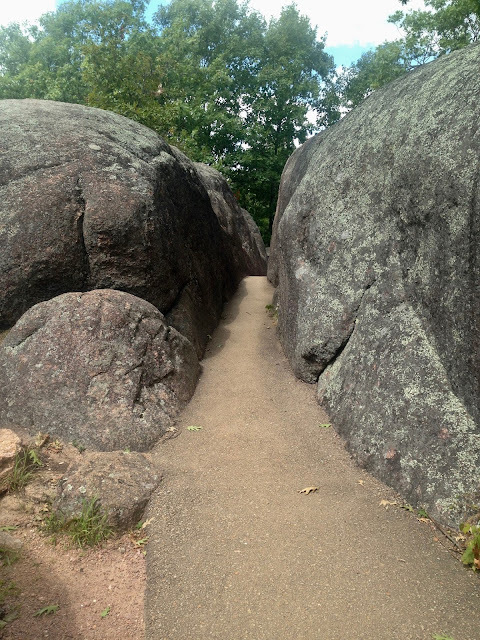 Speaking of squeeze through passages, this trail is called "Fat Man's Squeeze"! It's funny, but not very politically correct! 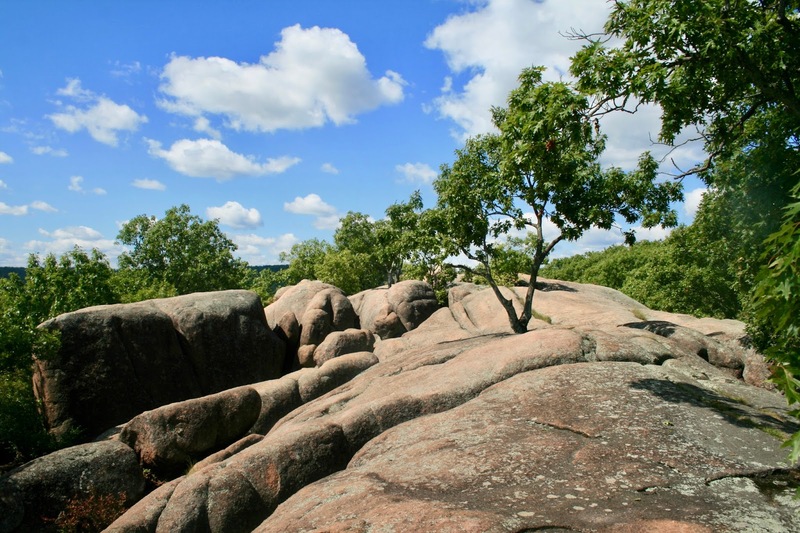 If you love nature and climbing rocks, you will love Elephant Rock State Park! It was in our top three favorites of the six Missouri state parks we visited! Gads those rocks are amazing !!! And it's nice to have a somewhat easier hike every once in a while. this was so fun thanks Amy !! 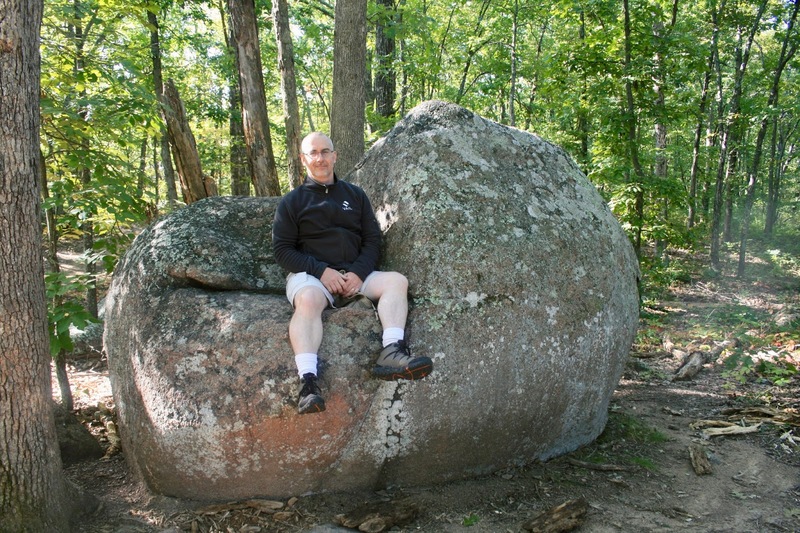 Yes, it was very relaxing, unlike a lot of other hikes we've done! That looks like such a beautiful hike! 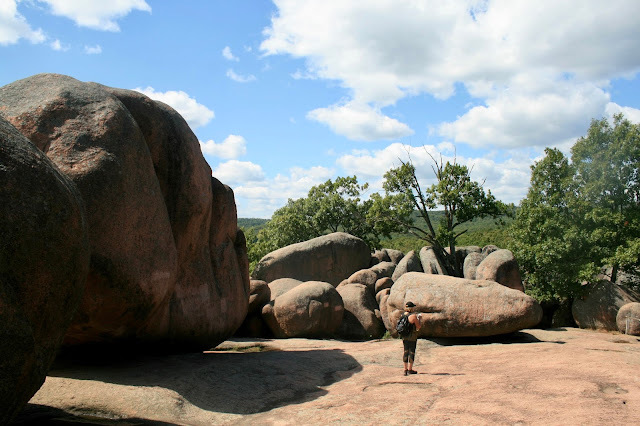 It seems to have the perfect scenery and those boulders are so cool. I'm glad to hear that you enjoyed it! I just love visiting this place! We'll usually drive down and pack a picnic lunch to enjoy while there. We haven't taken the kids in probably 5 years... I'd like to go back sometime soon and see it again. I've only been there a couple times. I love how you went off the trail and explored, I haven't done that! You got so many nice photos! Wow! Thanks Carrie...oh yes, half the fun is taking the other trails that are not paved! This looks like such a fun place to visit! 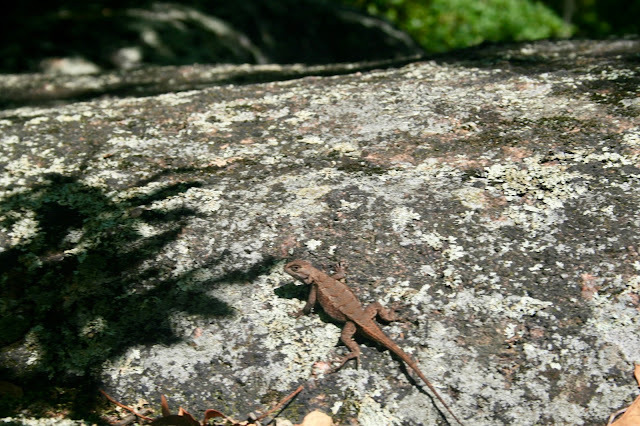 Love those rocks and the little critters!! Just checked how far it's from us and it looks like it's less than 5 hours away. I think it would make a fun long weekend getaway! Oh Elli, you have to take your kids here! They would love it! 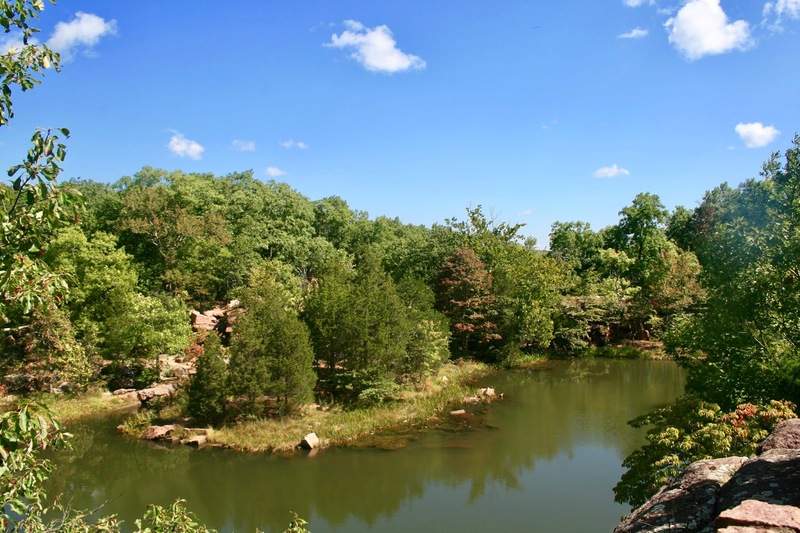 Missouri would be a good vacation spot for you because it's not so far away. If you go, you have to stop in St. Charles too. St. Louis is also a great vacation spot. The arches are so fun (did you know you can go inside?) and the botanical gardens is one of the best in the nation. 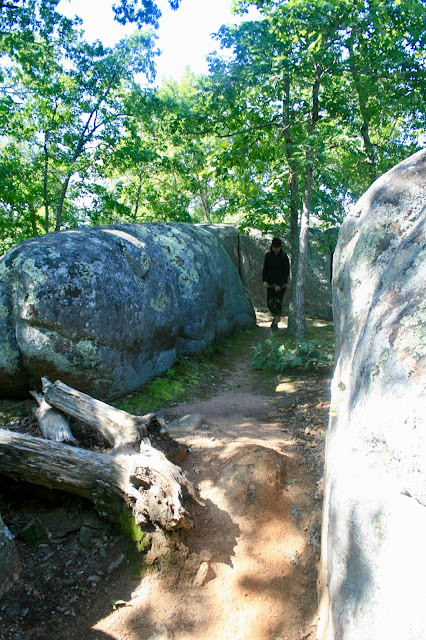 I really like the trees growing around the rocks, but Fat Mans Squeeze made me claustrophobic just looking at it! Ha! Thanks Nick! Yes, I liked that too and found it very interesting. I always point out in my travel posts if trails are handicapped accessible because I know so many people would love to get out and explore nature and may not have the capability. It's also great for families who have small children and need to use strollers!